A great choice if you're interested in interactive picture books. Or wanting something to read on a long car trip! "Are we there yet?" Every parent has heard this classic kid question on a long car ride--and after reading this astonishingly inventive new book (that even turns upside down for several pages! ), you'll never look at being bored the same way again. Let's face it: everyone knows that car rides can be boring. And when things get boring, time slows down. In this book, a boy feels time slowing down so much that it starts going backward--into the time of pirates! Of princesses! Of dinosaurs! The boy was just trying to get to his grandmother's birthday party, but instead he's traveling through Ancient Egypt and rubbing shoulders with Ben Franklin. When time flies, who knows where--or when--he'll end up. Are We There Yet? was written by and illustrated by Dan Santat. It was published in 2016 by Little, Brown and Company. It would be fun to talk about the different time periods shown in this story. This book could also be used as a starting point for discussing different modes of transportation. An interesting project might be to look at a few of the different books Dan Santat has illustrated to study his illustration style. If you were in the car on the way to Grandma’s house, what “side trip” would your imagination take you on. Draw a picture to show where you’d travel. Create a paper book with a few pages and try to recreate the cool reversal that happens in this story to see how it works. Use arrows to show where the story goes. What is your favorite scene from the story? Explain why. 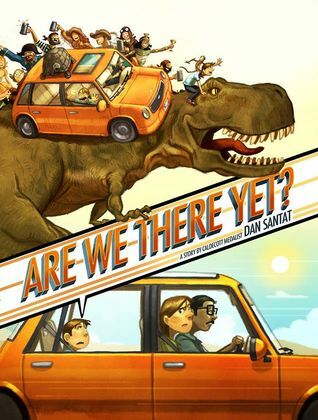 Dan Santat is so talented! I have not yet picked up this book, but I'd like to! Thank you for dropping by, Dawn! Thanks, Vivian! This one would be a tough act to follow -- you'd have to take it for a "spin" in a different direction. Ha, love the spin on this very well known phrase. Great idea and review. Thanks for sharing. This sounds like such a fun read and an interesting take on the typical kid question. I love the back in time aspect, and I can see how this would be great to use in the classroom. Thanks for featuring it!